There’s one portion of my 25 things list that I think I am going to be able to knock out rather easily. Reading 19 books. When I first made the commitment, I thought reading that many books in a year would really be a challenge for me, but it’s going by quicker than I thought. 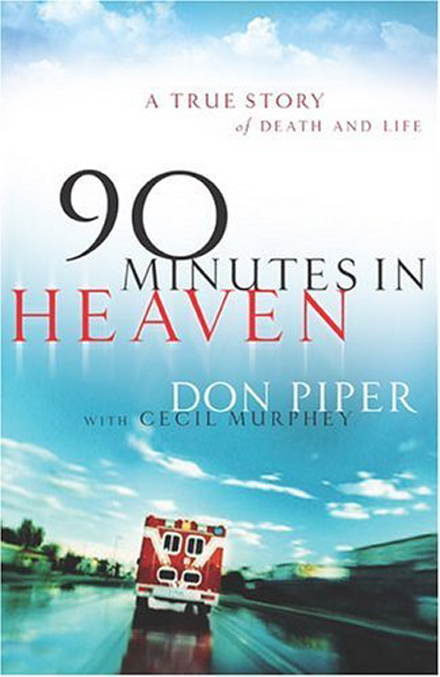 90 Minutes in Heaven is a book about a pastor that gets in a severe car wreck on his way home from a conference. It’s so severe that they pronounce him dead on the scene and leave him in his mangled car as they patiently wait for the jaws of life to come peel him out of the car and the wreckage to be cleared. Another pastor who was at the same conference happens upon the accident scene. He feels lead to pray for the man, the dead man. He crawls through the trunk of the car, his only way to access the dead man, lays his hand on him and begins to pray. At some point in his prayer, the pastor began to sing and was shocked and scared when the dead man began to sing with him. Sounds like something out of Days of Our Lives (minus the prayer part), but it’s the true story of one man’s return from death and his taste of Heaven. The heaven that the author describes in the book is incredible, freeing – everything you would link it would be. He talks about the people he loves waiting for him in Heaven. Someone had told me once that we wouldn’t recognize our loved ones from Earth in Heaven. Honestly, this made me sad. To think that I could spend 60 years of my life married to Casey and then not even recognize him for eternity. This book gave me new hope that won’t be the case. It also painted an incredible picture of the transcending peace that God’s love gives us. An ultimate joy. A freeing peace. A love greater than anything we can experience on Earth. It makes my heart melt to hear the stories and imagine the feeling. Here’s hoping that we get to experience this amazing place with the ones we love one day. Have you read this book? What were you thoughts/takeaways?